Sri Venkateshwara College of Engineering (SVCE) is a premier educational institution devoted to education in Engineering and Management and offers graduate and post graduate courses. Established in 2001, this institution is affiliated to VTU, Belgaum and is approved by AICTE, New Delhi. It is an ISO 9001:2008 institution. Vision: To provide and promote intellectual competence through best of infrastructure facilities and qualified, educated and dedicated faculty for the students to face the challenges for a dream career during the critical phase. The Institute shall produce graduates ethical, caring, life-long learners; who will provide quality service for the ever growing regional, national and global industry need. Mission: To be a premier Institution in the country for integrative educational innovation and an interprofessional technical and managerial development that utilizes advanced technology, state-of-the-art facilities to enable them to be honorable Engineers and Managers. Managed by a Board with good vision, the institution aims to provide and promote intellectual competence of its students by offering them the best infrastructure facilities and a highly qualified and dedicated faculty. They have created state of the art facilities at their institution and their mission is to be the premier institution in the country for an integrative educational innovation. 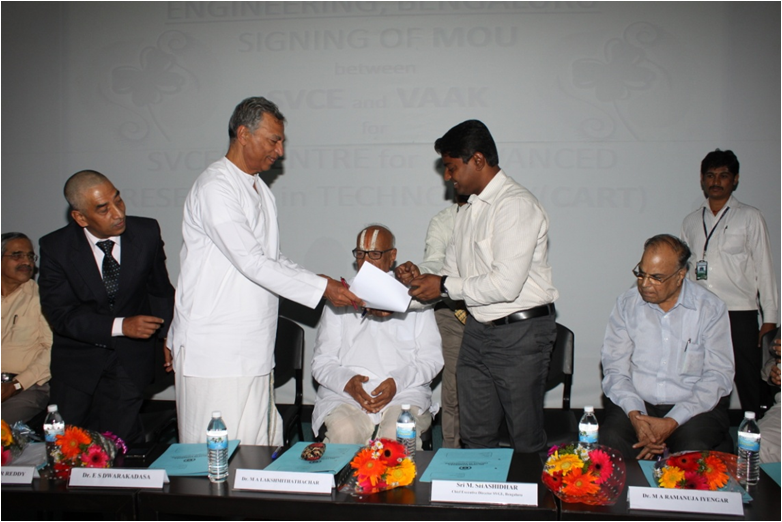 SVCE strives to be recognized as a centre of excellence for learning in Engineering, Technology and Management. The Campus: The college campus is located at Chikkajala, Vidyanagar about 22 kms from Banglore on the National Highway No.7. The college is approved by AICTE, New Delhi and affiliated to VTU Belgaum. The International Airport at Devanahalli is 6 km away from the campus. Understanding that the best of coaching and attention will lead to optimal benefit only when taught in a conducive environment, basic facilities in the campus have been created with lot of thought and care. To integrate information system technology into the present curriculum, the college is equipped with Internet connectivity, through Wi-Fi system connecting students to the world. The faculty and the students are allowed to surf the net free of cost. 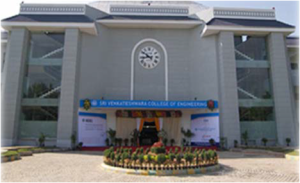 Sri Venkateshwara College of Engineering is a leader in technical education and in the development of ideas that shape the world’s understanding of engineers. We are proud of our position as the top academic college of engineering and proud of the people who make it so – our students, faculty, staff and the management. Sri Venkateshwara College of Engineering was desirous of establishing a school of Indigenous science and technology and having identified Samskriti Foundation and VAAK as an ideal partner who can complement them with the inputs in terms of their knowledge and rich experience, have come together to establish a research centre at SVCE, Yelahanka, Bangalore. 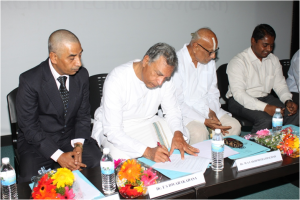 This research centre, known as Centre for Advanced Research on Technology (CART) is perhaps the first research organization established by an educational institution that will be conducting research based on ancient Indian knowledge systems. This arrangement will benefit both the organizations. 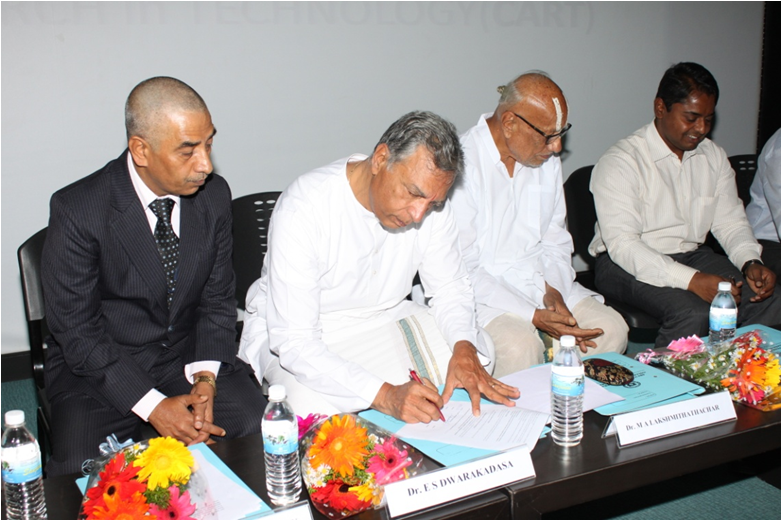 As a well-established educational institution conducting courses in Engineering, SVCE will be establishing a research facility in its institution and will be the pioneer among educational institutions to take up research in the area of ancient Indian knowledge systems on science and technology. It will also be able to offer post graduate courses and research facility in this area to its students. VAAK which is a unit of Samskriti Foundation established to generate a greater interest in the science & technology prevalent in the ancient period will get an academic base and a good infrastructure which will allow it to undertake research work on the ancient science and technology and get the findings in them validated and adapted into the modern technology systems. Thus, the arrangement will provide opportunities for both the organizations to grow and pursue their objectives. signed a Memorandum of Understanding. 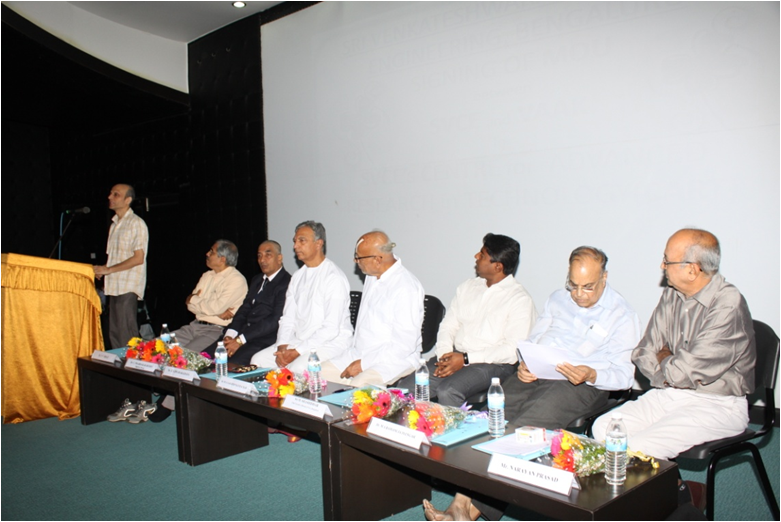 The Secretary of Sri Venkateshwara group of Institutions, Dr. M. Shashidhar, who presided over the function addressed the gathering and gave an overview of the vision with which two organizations have come together and what their mission is. 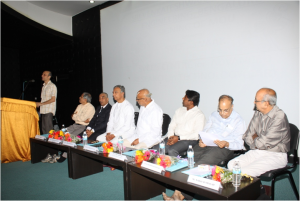 This was followed by members of VAAK, namely Prof M. A. Lakshmithathachar, Dr. E. S. Dwarakadasa, Dr. M. A. R. Iyengar, Dr. V. V. Bhat and M. A. N. Prasad briefly sharing their views on the role of the CART. Dr. Prabhakara Reddy thanked both the organizations for providing the research facility and expressed his confidence that the research institution would produce good results. To begin with CART would take up research in the field of metallurgy, Information Technology and water treatment. Gradually, in due course of time, other areas may get added on.